Objective To assess whether the use of dipeptidyl peptidase-4 inhibitors is associated with the incidence of inflammatory bowel disease in patients with type 2 diabetes. Setting More than 700 general practices contributing data to the United Kingdom Clinical Practice Research Datalink. Participants A cohort of 141 170 patients, at least 18 years of age, starting antidiabetic drugs between 1 January 2007 and 31 December 2016, with follow-up until 30 June 2017. 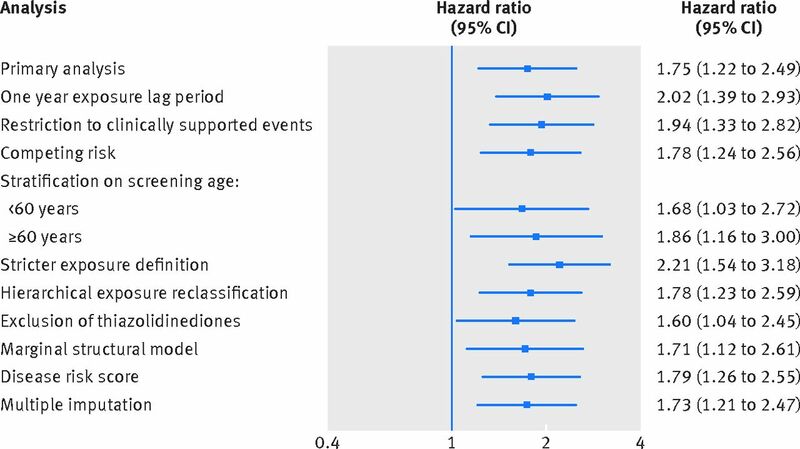 Main outcome measures Adjusted hazard ratios for incident inflammatory bowel disease associated with use of dipeptidyl peptidase-4 inhibitors overall, by cumulative duration of use, and by time since initiation, estimated using time dependent Cox proportional hazards models. Use of dipeptidyl peptidase-4 inhibitors was modelled as a time varying variable and compared with use of other antidiabetic drugs, with exposures lagged by six months to account for latency and diagnostic delays. Results During 552 413 person years of follow-up, 208 incident inflammatory bowel disease events occurred (crude incidence rate of 37.7 (95% confidence interval 32.7 to 43.1) per 100 000 person years). Overall, use of dipeptidyl peptidase-4 inhibitors was associated with an increased risk of inflammatory bowel disease (53.4 v 34.5 per 100 000 person years; hazard ratio 1.75, 95% confidence interval 1.22 to 2.49). Hazard ratios gradually increased with longer durations of use, reaching a peak after three to four years of use (hazard ratio 2.90, 1.31 to 6.41) and decreasing after more than four years of use (1.45, 0.44 to 4.76). A similar pattern was observed with time since starting dipeptidyl peptidase-4 inhibitors. These findings remained consistent in several sensitivity analyses. Conclusions In this first population based study, the use of dipeptidyl peptidase-4 inhibitors was associated with an increased risk of inflammatory bowel disease. Although these findings need to be replicated, physicians should be aware of this possible association. The effect of the dipeptidyl peptidase-4 enzyme in autoimmune conditions such as inflammatory bowel disease is not well understood. On the one hand, studies in mouse models of inflammatory bowel disease suggest that treatment with dipeptidyl peptidase-4 inhibitors results in decreased disease activity.78910 On the other hand, clinical data indicate that patients with inflammatory bowel disease have lower serum dipeptidyl peptidase-4 enzyme concentrations than healthy controls.61112 Moreover, such lower concentrations are inversely associated with increased disease activity, although whether this is the cause or consequence of active disease is unclear.1213 To date, the association between dipeptidyl peptidase-4 enzyme concentrations and incident inflammatory bowel disease has not been studied. To our knowledge, no observational study has specifically investigated the association between use of dipeptidyl peptidase-4 inhibitors and the incidence of inflammatory bowel disease. Thus, the objective of this population based study was to determine whether the use of dipeptidyl peptidase-4 inhibitors is associated with the incidence of inflammatory bowel disease in patients with type 2 diabetes. This study used data from the Clinical Practice Research Datalink (CPRD), a primary care database from the UK. The CPRD records demographic and lifestyle information, prescription data, referrals, and diagnoses for more than 15 million patients in more than 700 general practices. These data are representative of the general UK population and have been shown to be of high quality and validity.141516 The CPRD uses the Read code classification for medical diagnoses and procedures,17 and a coded drug dictionary based on the British National Formulary for prescription details. We identified a base cohort of patients, at least 18 years of age, newly treated with non-insulin antidiabetic drugs (metformin, sulfonylureas, meglitinides, thiazolidinediones, acarbose, dipeptidyl peptidase-4 inhibitors, glucagon-like peptide 1 receptor agonists, and sodium-glucose co-transporter-2 inhibitors) between 1 January 1988 and 31 December 2016. Patients were required to have at least one year of medical history in the CPRD before their initial prescription. We excluded patients treated with insulin at any time before their initial prescription for a non-insulin antidiabetic drug (that is, patients with advanced disease) and female patients with a history of polycystic ovary syndrome (at any time before their initial prescription) or a history of gestational diabetes (in the year before their initial prescription), as these are other indications for metformin. Within the base cohort, we assembled a study cohort of patients who started a new antidiabetic drug class not previously used in their treatment history in or after 2007 (the year the first dipeptidyl peptidase-4 inhibitor, sitagliptin, entered the UK market).3 This cohort thus included patients newly treated for diabetes, as well as those for whom treatment was newly modified (add-ons or switches). Cohort entry was the date of this new antidiabetic prescription. At this stage, we excluded patients previously diagnosed as having inflammatory bowel disease, including those previously exposed to mesalamine, at any time before cohort entry (Crohn’s disease and ulcerative colitis; Read codes listed in supplementary table A). Diagnoses of inflammatory bowel disease have been previously validated in the CPRD, with positive predictive values above 90%.181920 We also excluded patients with a history of diverticulitis, ischaemic colitis, pseudomembranous colitis, or unspecific colitis (common differential diagnoses for inflammatory bowel disease21) at any time before cohort entry. Finally, we excluded patients with less than six months of follow-up after cohort entry to account for a latency period and known diagnostic delays of inflammatory bowel disease.22 All patients were followed starting six months after cohort entry until an incident diagnosis of inflammatory bowel disease or censored on an incident diagnosis of ischaemic colitis or diverticulitis, death from any cause, end of registration with the general practice, or the end of the study period (30 June 2017), whichever occurred first. We modelled the use of dipeptidyl peptidase-4 inhibitors (alone or in combination with other antidiabetic drugs) as a time varying variable and compared it with the use of all other antidiabetic drugs. As part of this exposure definition, patients could move from a period of non-exposure to a period of exposure after a six month lag period (allowing them to contribute both unexposed and exposed person time). Thus, patients were considered exposed starting six months after their first prescription until the end of the follow-up period, analogous to an intention to treat approach. Consequently, we considered inflammatory bowel disease events occurring during the six month lag period to be unexposed events. The use of a lag period was necessary for latency considerations, given that exposures of short duration are unlikely to be associated with the incidence of inflammatory bowel disease, to account for possible diagnostic delays associated with inflammatory bowel disease,22 and to reduce detection bias and reverse causality. Finally, we deemed the comparator group of other antidiabetic drugs to be appropriate, as none of these drugs has been previously associated with the incidence of inflammatory bowel disease. We considered this to be the definition of primary exposure. We also considered two definitions of secondary exposure. The first assessed the association according to cumulative duration of dipeptidyl peptidase-4 inhibitor use. We defined this time dependent variable by summing the durations associated with each prescription up until time of event. The second assessed time since initiation, which we defined in a time dependent fashion as the time between the first dipeptidyl peptidase-4 inhibitor prescription and time of event. We did four secondary analyses. Firstly, we assessed whether a duration-response relation existed according to cumulative duration of use by estimating hazard ratios for five predefined duration categories (≤1 year, 1.1-2 years, 2.1-3 years, 3.1-4 years, and >4 years). Secondly, we investigated the association with time since initiation by estimating hazard ratios for three predefined categories (≤2 years, 2.1-4 years, and >4 years). We also modelled cumulative duration of use and time since initiation as continuous variables by using restricted cubic splines. Thirdly, to investigate the possibility of a drug specific effect, we repeated the analysis stratifying by type of dipeptidyl peptidase-4 inhibitor (sitagliptin, saxagliptin, and other). Finally, we repeated the primary analysis by stratifying on type of inflammatory bowel disease (Crohn’s disease, ulcerative colitis, and unspecified disease). We did two ancillary analyses to further assess the validity of our findings. The first used insulin as a negative control exposure,30 a last line treatment that has not been associated with inflammatory bowel disease. 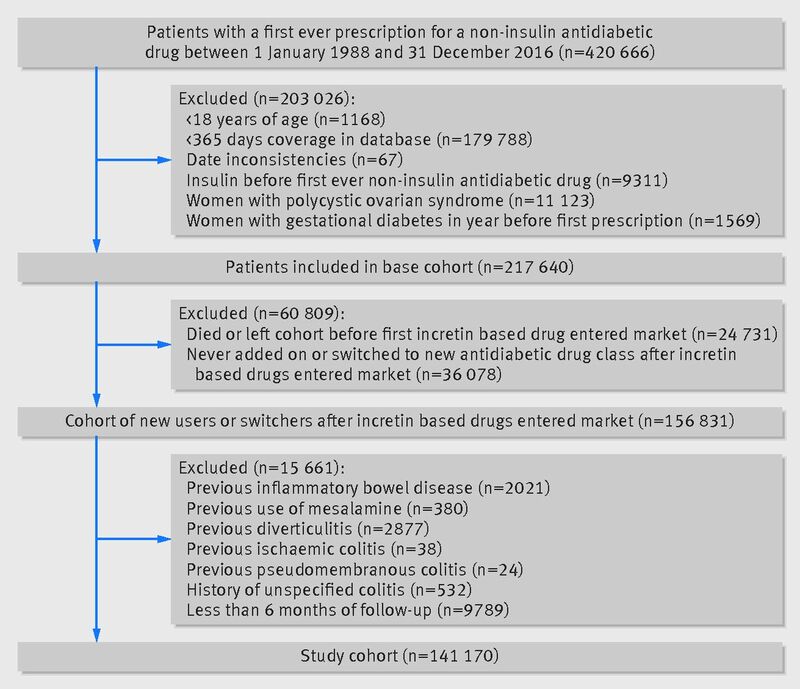 For this analysis, we excluded prevalent users of insulin before cohort entry and modelled new use of insulin as a time dependent variable lagged by six months. The second was a head to head comparison of patients newly treated with dipeptidyl peptidase-4 inhibitors versus insulin between 1 January 2007 and 31 December 2016, with follow-up until 30 June 2017. For this analysis, a Cox proportional hazard model was stratified on fifths of propensity score (supplementary methods 5). We used SAS version 9.4 for all the analyses described above. We did not include patients as study participants, as our study involved the use of secondary data. Patients were not involved in the design or implementation of the study. We do not plan to involve patients in the dissemination of results, nor will we disseminate results directly to patients. We included 141 170 patients in the cohort (fig 1). These patients were followed for a median of 3.6 (interquartile range 1.6-5.9) years beyond the six month post-cohort entry lag period. During 552 413 person years of follow-up, 208 incident inflammatory bowel disease events occurred, generating an incidence rate of 37.7 (95% confidence interval 32.7 to 43.1) per 100 000 person years. Nearly all these events (n=193; 92.8%) had at least one clinically relevant supporting event (supplementary table B). Overall, 30 488 (21.6%) patients received at least one prescription for a dipeptidyl peptidase-4 inhibitor during the study period; the median duration of use was 1.6 (interquartile range 0.7-3.1) years. Table 1 shows the baseline characteristics of the entire cohort and the cohort stratified by drug use at cohort entry. Compared with users of other antidiabetic drugs, dipeptidyl peptidase-4 inhibitor users were older, more likely to have higher haemoglobin A1c concentrations, more likely to have a longer duration of treated diabetes, and more likely to have microvascular complications of diabetes. Users of dipeptidyl peptidase-4 inhibitors were also more likely to have used aspirin and non-steroidal anti-inflammatory drugs but less likely to have used oral contraceptives. Table 2 shows the results of the primary and secondary analyses. Compared with use of other antidiabetic drugs, use of dipeptidyl peptidase-4 inhibitors was associated with a 75% increase in risk of inflammatory bowel disease (53.4 v 34.5 per 100 000 per year; hazard ratio 1.75, 95% confidence interval 1.22 to 2.49). The number needed to harm corresponded to 2291 patients followed over a two year period and 1177 over a four year period. In secondary analyses, hazard ratios gradually increased with longer durations of use, reaching a peak after three to four years of use (hazard ratio 2.90, 1.31 to 6.41) and decreasing after more than four years of use (1.45, 0.44 to 4.76). A similar pattern was observed with time since initiation, with the highest hazard ratio observed between two and four years after initiation (2.50, 1.57 to 3.99) and a decrease after more than four years (1.75, 0.86 to 3.58). These patterns remained consistent in the cubic spine models (supplementary figures A and B). Overall, no single dipeptidyl peptidase-4 inhibitor drug was statistically associated with inflammatory bowel disease, although the strata had few events (supplementary table C). In analyses stratified on type of inflammatory bowel disease, the use of dipeptidyl peptidase-4 inhibitors was associated with a greater than twofold increase in risk of ulcerative colitis (hazard ratio 2.23, 1.32 to 3.76), whereas no statistically significant association was observed with Crohn’s disease (0.87, 0.37 to 2.09) (supplementary table D). Figure 2 summarises the results of the sensitivity analyses (shown in detail in supplementary tables E-N and supplementary figure C). Overall, these analyses produced results that were consistent with those of the primary analysis, with statistically significant hazard ratios ranging between 1.60 and 2.21. The negative control analysis comparing the use of insulin with the use of other antidiabetic drugs yielded a hazard ratio close to the null value (0.92, 0.53 to 1.58; table 3). In the head to head comparison, use of dipeptidyl peptidase-4 inhibitors was associated with a greater than twofold increase in risk of inflammatory bowel disease, compared with insulin (hazard ratio 2.28, 1.07 to 4.85) (table 3, supplementary figure D and supplementary table O). To our knowledge, this is the first observational study to specifically investigate the association between the use of dipeptidyl peptidase-4 inhibitors and the incidence of inflammatory bowel disease. Use of dipeptidyl peptidase-4 inhibitors was associated with an overall 75% increase in risk of inflammatory bowel disease. In secondary analyses, the association was particularly elevated between three and four years of use and between two and four years after the start of dipeptidyl peptidase-4 inhibitor treatment. This gradual increase in the risk is consistent with the hypothesis of a possible delayed effect of the use of dipeptidyl peptidase-4 inhibitors on the incidence of inflammatory bowel disease. This association remained highly consistent across a variety of sensitivity analyses. In contrast to the aforementioned animal studies that have supported a role for dipeptidyl peptidase-4 inhibitors in the treatment of inflammatory bowel disease,78910 our study focused on incident inflammatory bowel disease, in which dipeptidyl peptidase-4 may have a different biological function. Although one previous observational study reported a decreased risk of a composite of several autoimmune diseases (including inflammatory bowel disease) with the use of dipeptidyl peptidase-4 inhibitors (hazard ratio 0.68, 95% confidence interval 0.52 to 0.89),28 it did not report any findings on inflammatory bowel disease specifically. This decreased risk may have been driven by other diseases included in the composite outcome. Finally, our results indicate that an increased risk with dipeptidyl peptidase-4 inhibitors may be associated with ulcerative colitis and not Crohn’s disease. However, this finding should be interpreted with caution as this stratified analysis was based on few events, generating a wide confidence interval with an upper 95% confidence limit of 2.09. Thus, our results do not rule out a possible association with Crohn’s disease as well. In summary, although our findings need to be replicated, additional studies are also needed to understand the possible mechanism through which dipeptidyl peptidase-4 inhibitors may increase the risk of inflammatory bowel disease. This study has several strengths. Firstly, our study design excluded prevalent users, thus eliminating biases associated with their inclusion.32 Secondly, we used a time dependent exposure definition that allowed patients to contribute both unexposed and exposed person time, thereby eliminating immortal time bias.33 Type 2 diabetes and inflammatory bowel disease have been shown to share inflammatory pathways,34 although large population based studies have not reported an association between these two diseases.35 Nevertheless, we rigorously assessed the effect of possible residual confounding in several analyses; these analyses yielded consistent findings. Moreover, the null association observed with insulin (a last line treatment of which the users are typically at an advanced disease stage) as a negative control provides reassurance on the internal validity of our findings. Finally, our results remained highly consistent across a variety of sensitivity analyses intended to overcome different sources of bias. Our study has a few limitations. As prescriptions in the CPRD are written by general practitioners and not specialists, some exposure misclassification is possible. In the UK, however, type 2 diabetes is managed almost entirely through primary care,36 so such misclassification is likely to have been minimal. Although inflammatory bowel disease has been shown to be well recorded in the CPRD,181920 outcome misclassification is also possible. Reassuringly, we observed consistent findings in a sensitivity analysis using an algorithm based on clinically supporting events. Finally, as with all observational studies, residual confounding from unknown or unmeasured variables remains possible. However, on the basis of the rule out method,29 a hypothetical confounder would need to be strongly associated with both the exposure (odds ratio >4.7) and the outcome (relative risk >5.0) to move the point estimate towards the null (supplementary figure C). Whether such a hypothetical confounder exists beyond those considered in the analyses is unclear. The results of this large population based cohort study indicate that the use of dipeptidyl peptidase-4 inhibitors is associated with an overall 75% increase in the risk of inflammatory bowel disease in patients with type 2 diabetes. Although the absolute risk is low, physicians should be aware of this possible association and perhaps refrain from prescribing dipeptidyl peptidase-4 inhibitors for people at high risk (that is, those with a family history of disease or with known autoimmune conditions). Moreover, patients presenting with persistent gastrointestinal symptoms such as abdominal pain or diarrhoea should be closely monitored for worsening of symptoms. Contributors: All authors conceived and designed the study. LA acquired the data. DA, AD, HY, and LA did the statistical analyses. All authors analysed and interpreted the data. DA wrote the manuscript, and all authors critically revised it. All authors approved the final version of the manuscript and agree to be accountable for the accuracy of the work. LA supervised the study and is the guarantor. Funding: This study was funded by a foundation scheme grant from the Canadian Institutes of Health Research. The sponsor had no influence on design and conduct of the study; collection, management, analysis, and interpretation of the data; and preparation, review, or approval of the manuscript. AD is the recipient of a research fellowship from the German Research Foundation (Deutsche Forschungsgemeinschaft, DFG). LA holds a Chercheur-Boursier junior 2 award from the Fonds de Recherche du Québec - Santé and is the recipient of a William Dawson scholar award from McGill University. Competing interests: All authors have completed the ICMJE uniform disclosure form at www.icmje.org/coi_disclosure.pdf (available on request from the corresponding author) and declare: this study was funded by the Canadian Institutes of Health Research; no financial relationships with any organisations that might have an interest in the submitted work in the previous three years; no other relationships or activities that could appear to have influenced the submitted work. Ethical approval: The study protocol was approved by the Independent Scientific Advisory Committee of the Clinical Practice Research Datalink (protocol number 17_165R) and by the Research Ethics Board of Jewish General Hospital, Montreal, Quebec, Canada. Transparency: The guarantor (LA) affirms that this manuscript is an honest, accurate, and transparent account of the study being reported; that no important aspects of the study have been omitted; and that any discrepancies from the study as planned (and, if relevant, registered) have been explained.
. Biochemical Properties of Recombinant Prolyl Dipeptidases DPP-IV and DPP8. In: Lendeckel U, Reinhold D, Bank U, eds. Dipeptidyl Aminopeptidases: Basic Science and Clinical Applications.Springer US, 2006: 27-32doi:10.1007/0-387-32824-6_3. U.S. National Library of Medicine. RCD (Read codes) – synopsis. 2017. https://www.nlm.nih.gov/research/umls/sourcereleasedocs/current/RCD/.
. A proportional hazards model for the subdistribution of a competing risk. J Am Stat Assoc1999;94:496-509doi:10.1080/01621459.1999.10474144. Public Health England. NHS bowel cancer screening (BCSP) programme. 2017. https://www.gov.uk/topic/population-screening-programmes/bowel.